From a stately English Manor to a home boasting a plethora of Old-World flare, these homes are among the most beautiful we’ve ever featured. 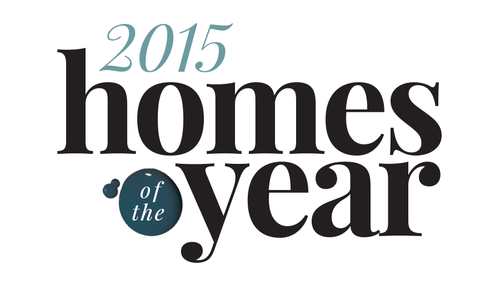 Let us take you inside this year's Homes of the Year. 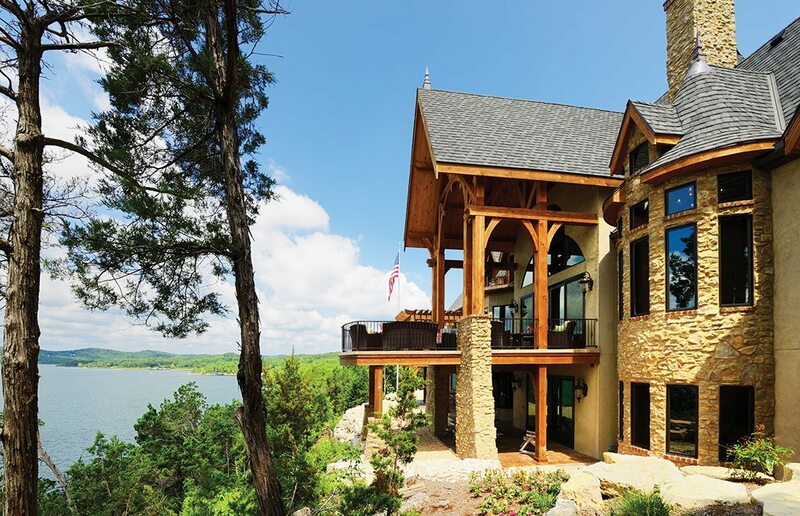 Photo by Jeremy Mason McGrawLocated on Table Rock Lake, this custom home by builder Jay Krause and custom home designer Ron Hill boasts a fully covered veranda that's perfect for relaxing and entertaining. 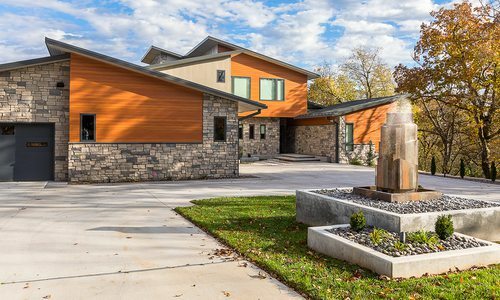 Earlier in the summer of 2014, we invited southwest Missouri builders to show us their very best work for our annual Homes of the Year contest. 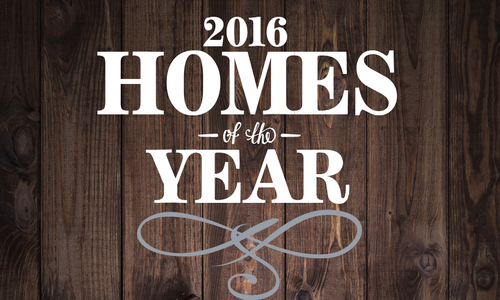 The entries were plentiful, including nearly 20 top-notch homes that were all well worthy of the honor. Next, a panel of judges narrowed the list down to the five best in four price categories. The winning homes range in style, featuring everything from clean lines and modern color palettes to chunky wooden beams and one-of-a-kind rustic touches. From a stately English Manor to a home boasting a plethora of Old-World flare, these homes are among the most beautiful we’ve ever featured. Check them out, learn the details and start planning your own dream-worthy space. 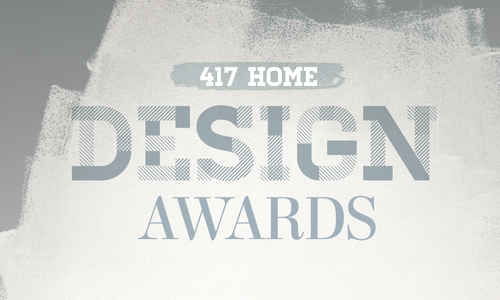 Get to know the creative masterminds highlighted in the 2014 Homes of the Year Contest, each of whom has years of experience building and designing one-of-a-kind dream homes. 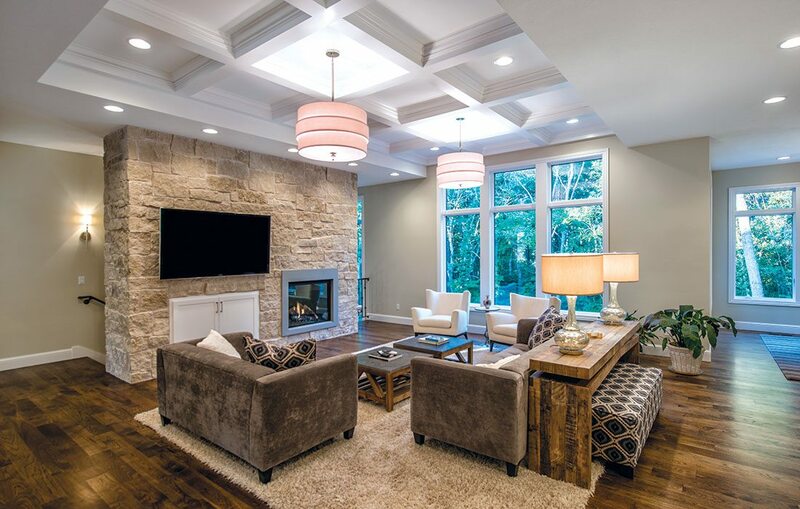 Custom builder Jay Krause started working in construction at an early age when his father, LeRoy Krause, started Krause Construction Company on Table Rock Lake. During his high school years, Krause’s summers were filled with pouring concrete, framing houses and more. He eventually worked his way into drafting plans, and then even became a general contractor at a young age. 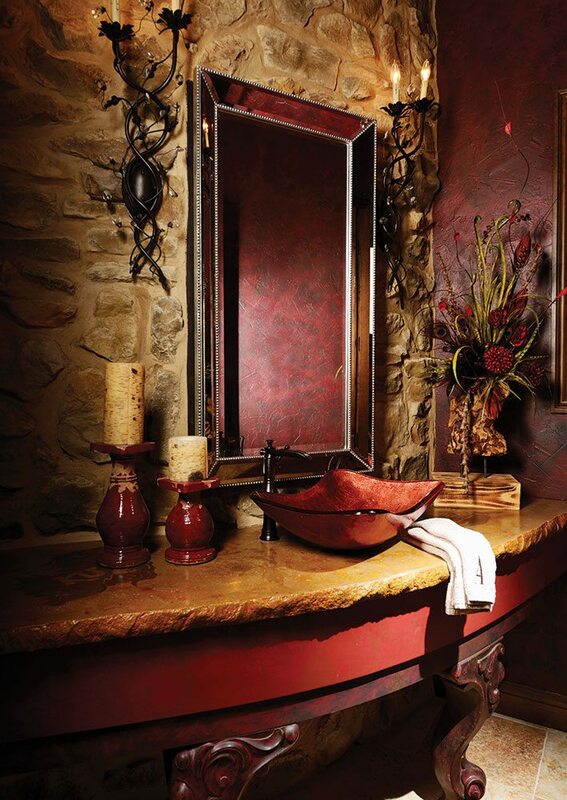 Krause worked with the company for decades, creating a plethora of resorts and custom homes, many near Table Rock Lake. 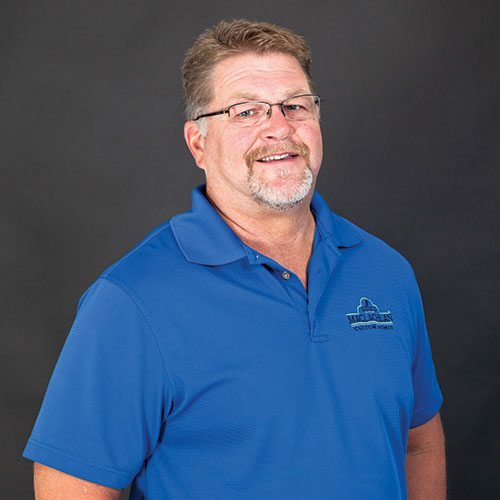 In 1993, Krause purchased Krause Construction Company with his wife, Tricia, and the two have been leading the way in quality construction ever since. 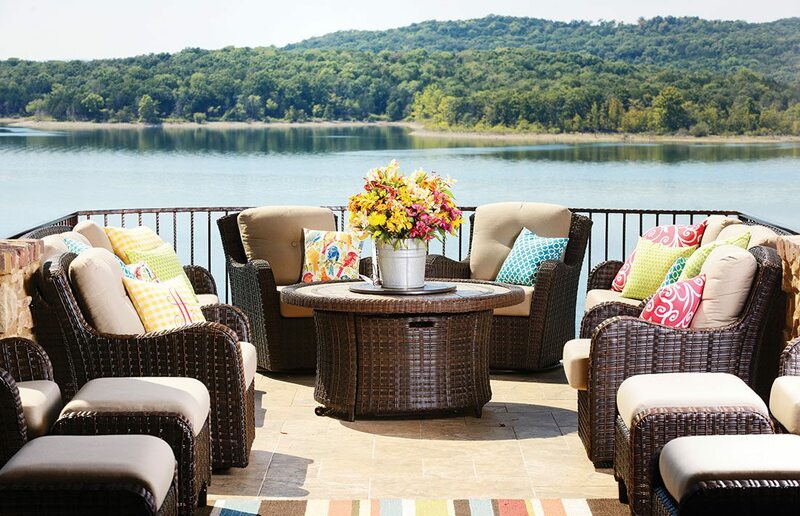 With five decades of building on Table Rock Lake, the company is well known for its quality and innovation. 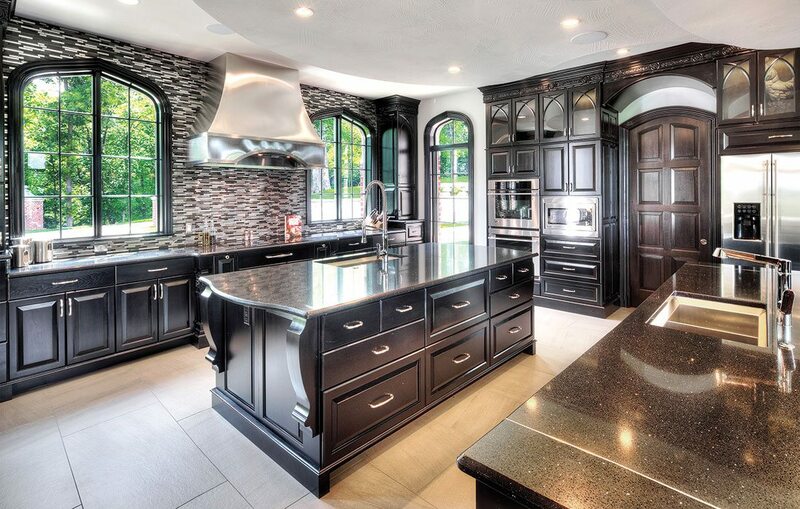 Custom Home Designer Ron Hill has been designing houses since 1978. It all began when he studied industrial technology and business at School of the Ozarks (now College of the Ozarks), where his studies were heavy on the residential side of the curriculum. Directly after college, Hill worked as a paramedic and designed homes on the side, and then he later studied at the Drury School of Architecture. Hill opened Finley River Design in 1992, and he moved to an office in Millwood in 2000. Next he designed many Millwood homes, eventually starting Euro World design in 2003. 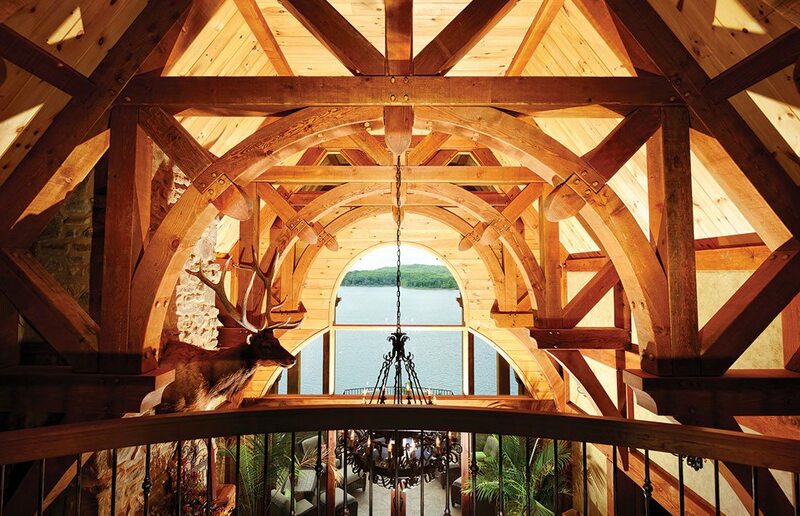 Since that time, Hill has designed everything from a custom dog house to homes larger than 20,000 square feet. He serves clients both all over the United States and abroad, including a couple in Australia. 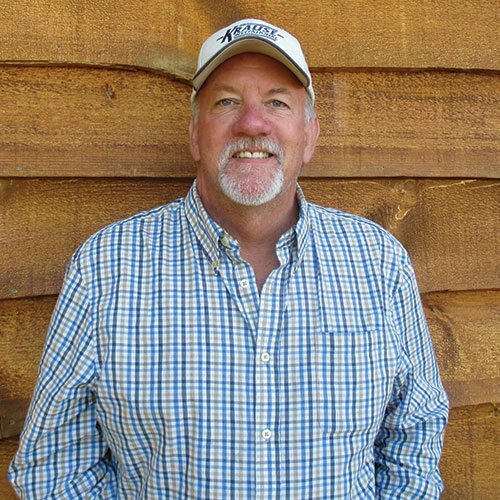 Well known for designing and building quality homes all around 417-land, custom builder Rick Ramsey began his building career in 1995. His journey first started when he began building rental homes to create his own rental portfolio. This didn’t last long, as he was quickly approached by people who wanted to purchase these rental properties. Ramsey found himself putting a one-of-a-kind twist on each home to suit each client’s taste, which led him to becoming a custom builder. 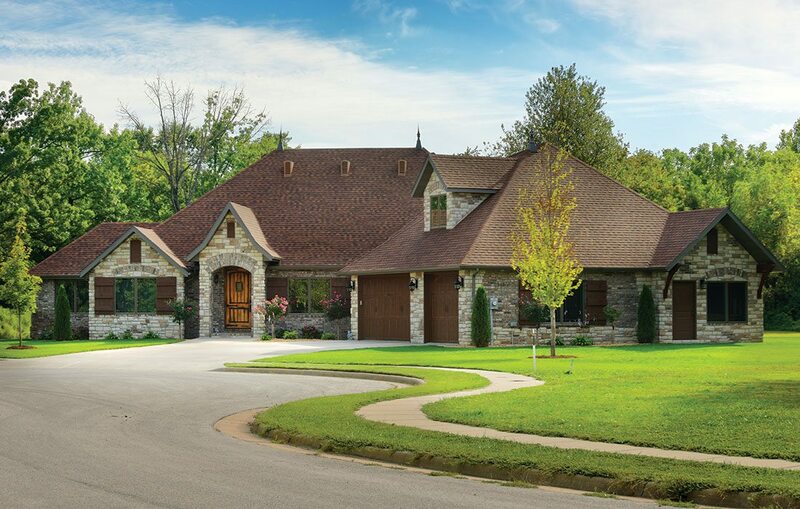 Today, Ramsey Building Company constructs homes all throughout southwest Missouri, and Ramsey says each has its own special touch. 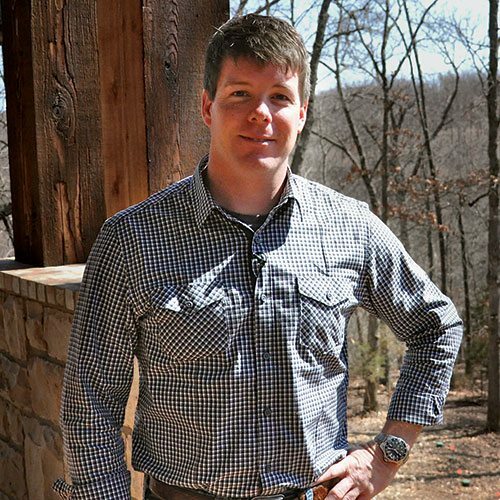 Before he became the established custom home designer and builder he is today, Adrian Rhoads received his degree in architecture from Drury University. 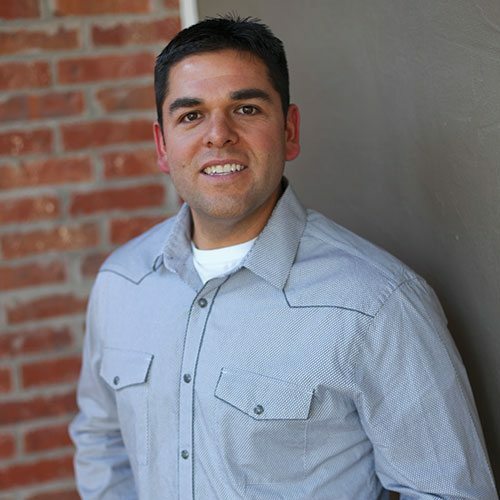 After graduating, Rhoads worked in commercial architecture for four years, and in 2004 he started Rhoads Design & Construction. In the beginning, the company primarily renovated existing homes, and it grew into constructing custom-designed homes. Over the years, Rhoads Design & Construction has been successful in both markets of design and construction, and it eventually added a full-time architect to its team. Rhoads says the company prides itself on focusing on relationships built with each client and, in turn, offering high quality services and craftsmanship. Home building has been passed down from father to son for more than seven generations in Rusty MacLachlan’s family. After earning a degree in business management, MacLachlan decided to try building, and he found he was passionate about creating homes for people to meet their needs. Now he has been building custom homes in 417-land for more than 30 years, and his wife, Julie, is the designer for many of his projects. 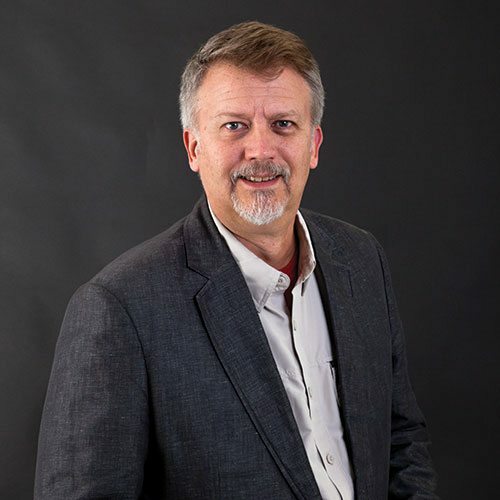 Custom designing and building new homes is MacLachlan’s specialty, and he works hard to please his clients and provide them with accounts and balances throughout the process. By building his business on honesty and integrity, MacLachlan has acquired repeat customers: One current client bought their first home from him, and they had him design and build two others as their family grew. Now, he’s building their retirement home. Combining mixed materials and shapes and modern conveniences and style, this lake-house getaway has an updated, European vibe. Photo by Jeremy Mason McGrawThe second level of the house offers a great view into the great room, where the ceiling is adorned with a custom-designed Douglas fir truss system. 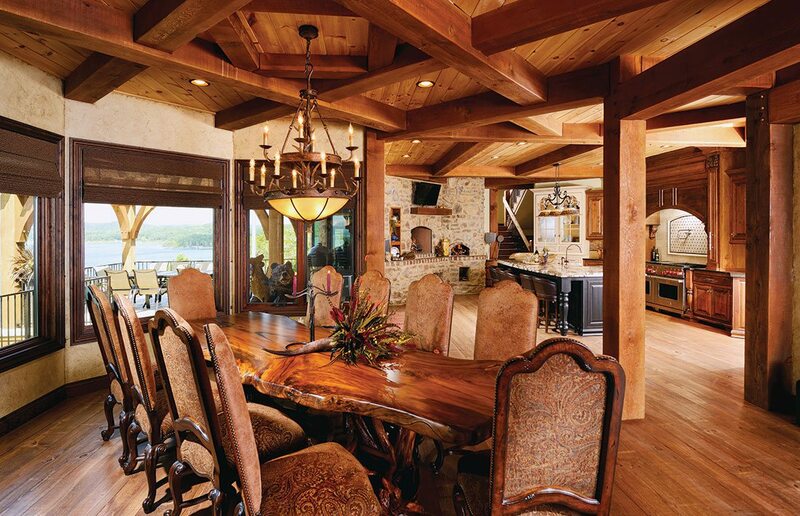 The beams create the perfect frame for a gorgeous view of Table Rock Lake. Growing up with a father who worked as a contractor, builder Jay Krause of Krause Construction figured he’d end up in the construction business. What he didn’t count on was being asked to build a 17,000-square-foot luxury home overlooking Table Rock Lake. Krause has owned Krause Construction in Kimberling City since 1990. 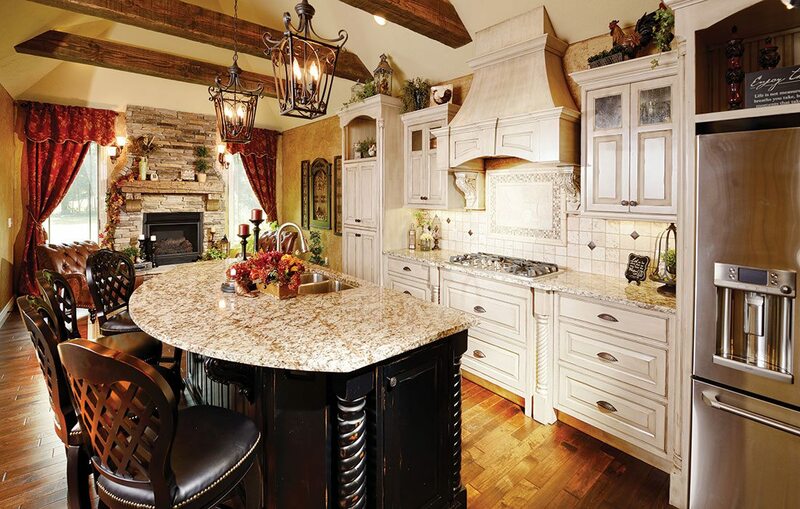 For this project, he enlisted custom home designer Ron Hill to enliven the clients’ European-style vision. Euro World Design is known for architecture influenced by the rich history of Old-World home construction, which favors restoration over ruin. As a result, many of Hill’s plans incorporate changes in materials and shapes. This estate is no exception. On the exterior, a round stone turret suggests French country, while sharp lines of timber add that mixed-materials effect. On the interior, beautiful post-and-beam work extends throughout the home’s seven bedrooms and 11 bathrooms, imparting a woodsy, cozy feeling, especially when combined with a warm color palette. Photo by Jeremy Mason McGrawWith features unmistakably characteristic of Euro World Design’s aesthetic, the grandeur of this residence is one-of-a-kind. 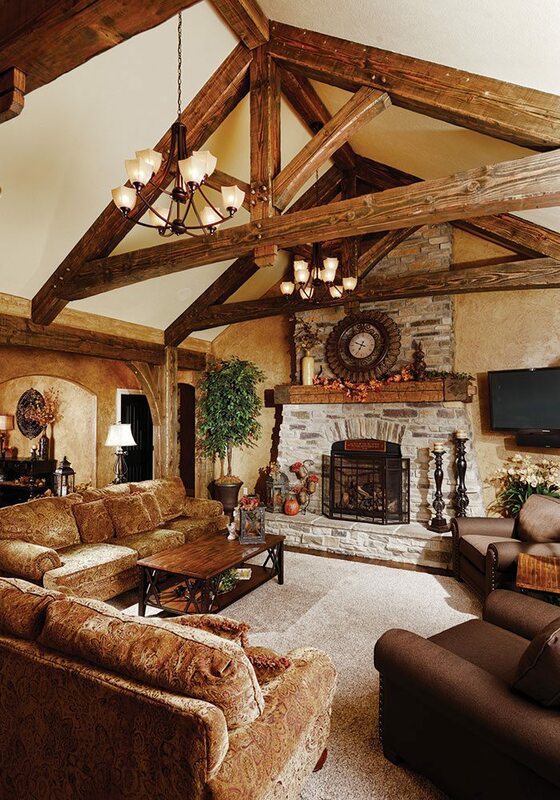 Decorative half timbering, stucco and stone combine to mimic the look of French Normandy homes. A central turret with a cone-shaped roof, a distinguishing feature of this architecture, encloses a staircase leading to upstairs bedrooms. The front door is reclaimed from a 19th century courthouse in Yorkshire, England. Shingles simulate slate while copper guttering and finials add a finishing touch. Photo by Jeremy Mason McGrawEntering the home’s great room is comparable to walking into a mountain lodge. 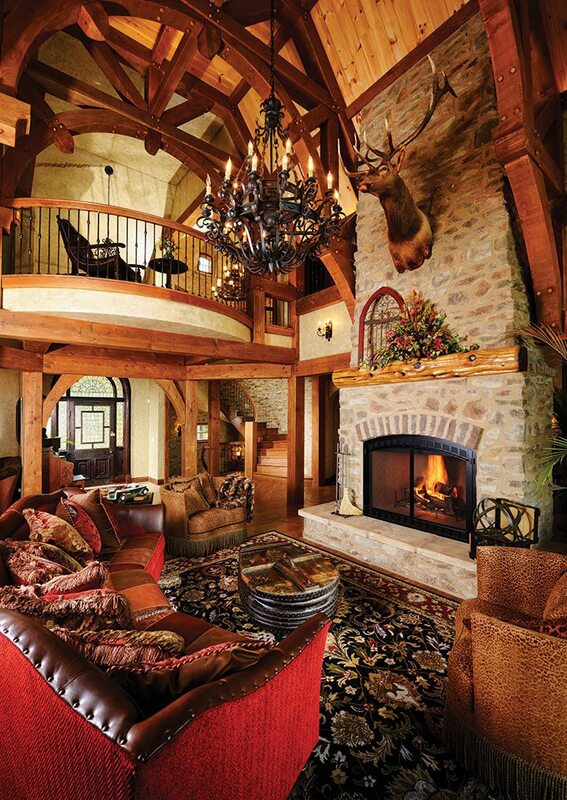 Heavy use of natural materials is evident in the Douglas fir trusses and fireplace. An iron chandelier, elk head and brown-and-red color palette continue the rustic theme. Completing the space, an antique blacksmith bellows serves as a one-of-a-kind coffee table. Photo by Jeremy Mason McGrawBecause the homeowners love surrounding themselves with family and friends, it’s fitting that the room often referred to as the heart of the home would be designed for gathering. 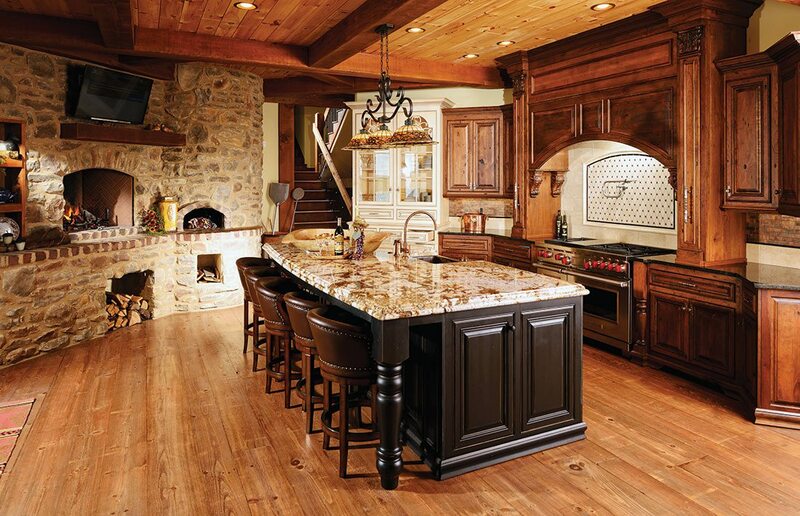 As satin-finish hardwood floors meander from the 54-inch gas range in the kitchen into the dining room, a granite-top island with golds and browns begs to be noticed. So does the tile backsplash above the stove, with its convenient pot-filler faucet that eliminates having to carry heavy pots of water from the sink. 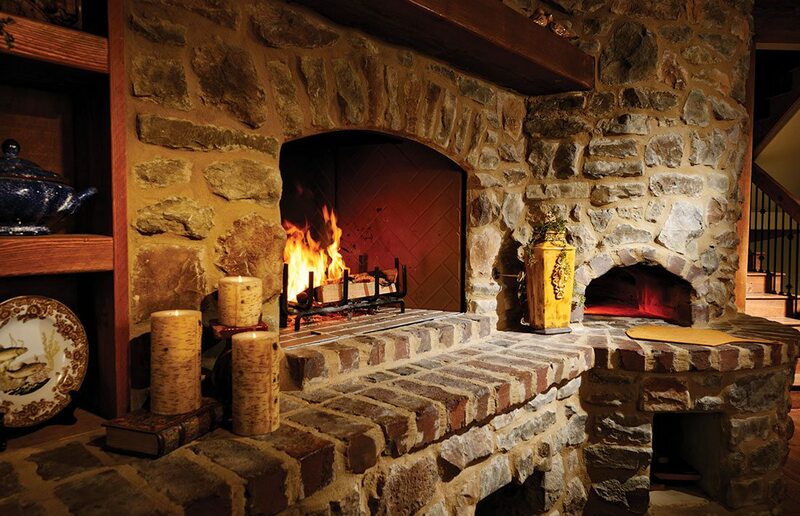 The pizza oven and fireplace are also one-of-a-kind. The fireplace opens to the outside for warming up after the sun goes down. Like the hardwood, a beamed ceiling is shared between the two rooms, inspiring a warm, intimate feeling throughout. A table carved from a sycamore tree has elbow room for 10 next to a trio of large windows with views to outdoor seating and the lake. 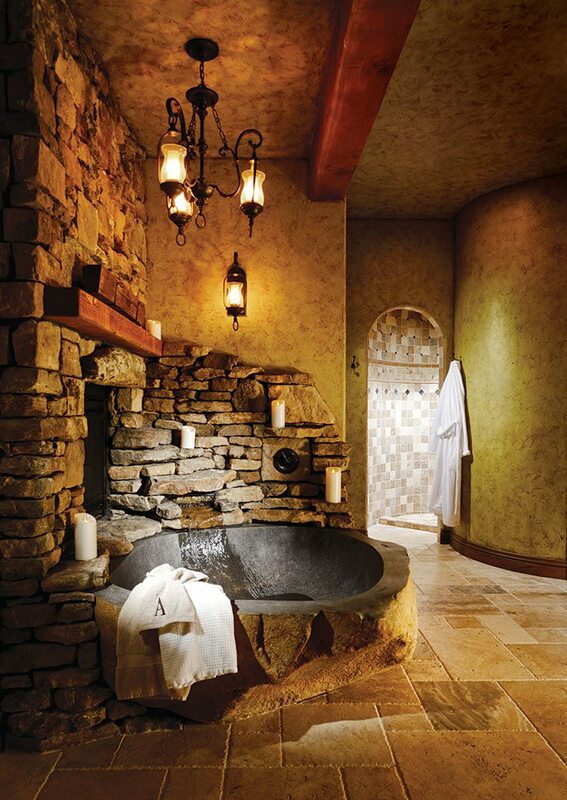 Photo by Jeremy Mason McGrawLike in many other rooms in the home, this earthen retreat displays faux-finished walls. In here, a tobacco glaze was applied and then blotted off with rags, resulting in a worn, leather-like appearance. Beyond an arched doorway, glossy tiles reflect the light and offer an invitation into a secluded, round shower. The stone of a see-through fireplace shared with the master bedroom wraps around a naturally shaped, one-of-a-kind bathtub. Photo by Jeremy Mason McGrawIn the powder room, a custom vanity made using old piano legs combines practicality with the homeowners’ allegiance to their favorite sports team, the St. Louis Cardinals. A red countertop band, red sink, and red candlesticks are also a salute to the Redbirds. Photo by Jeremy Mason McGrawEven adults marvel at this kid-friendly mural inspired by the classic C.S. Lewis book series The Chronicles of Narnia. Each story continues the tale of four siblings who find themselves in a magical land after crawling into a wardrobe during a game of hide and seek. 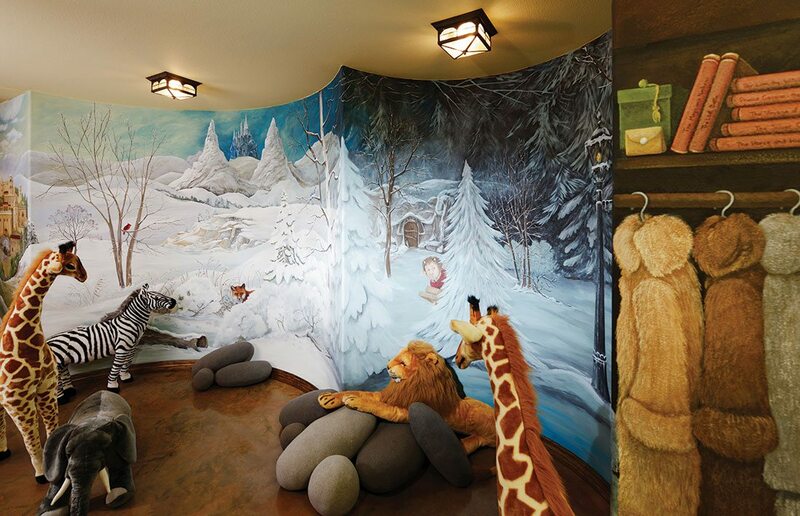 Curved walls depict characters and scenes from the story as they lead to the grandchildren’s suites. Stuffed animals bring the adventure to life and make it a fun spot to rest. 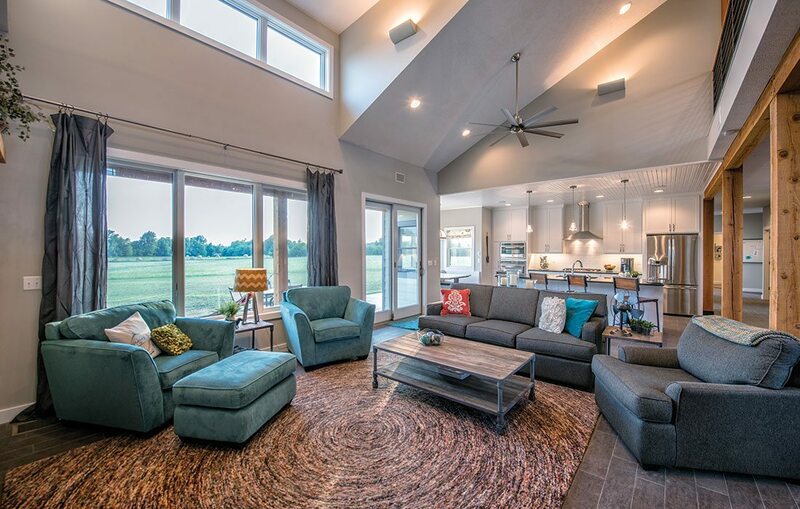 Overlooking an Ozarks prairie, this six-bedroom, five-bathroom custom-built home boasts clean lines and a modern color palette. Photo by James MaidhofWhat at first glance may appear to be a framed photograph of burning embers is actually a working fireplace, installed to add a bit of coziness and modern flair to this gathering space. 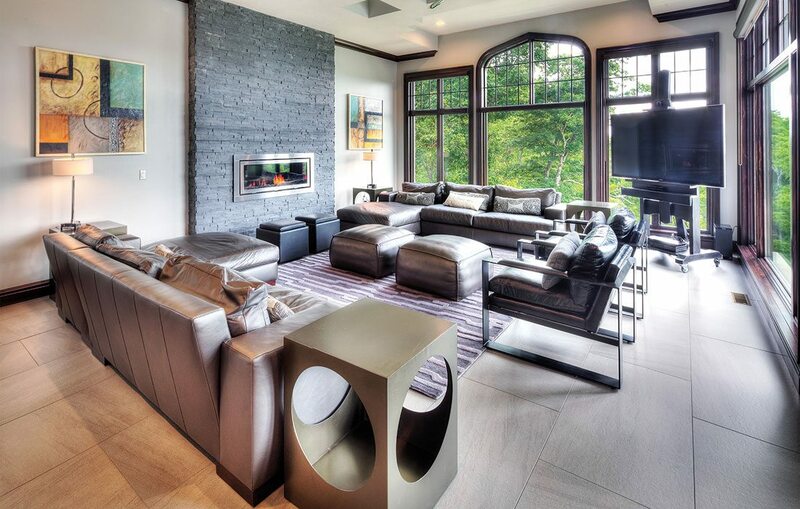 Other elements of visual interest include the recessed box ceiling and end tables with circular cutouts, which mimic elements of the contemporary artwork flanking the fireplace. Individual 2-foot-by-4-foot floor tiles give the illusion of one large piece of stone. When Rick Ramsey was in kindergarten, he loved to stack blocks. He also loved helping his parents as they built his childhood home. Sometimes, he’d discover scrap materials around the site and use them to make things. Fast forward to today, and you’ll find Ramsey at the helm of his own construction company, using skills he developed at a very young age to handcraft quality homes that reflect his clients’ characters and lifestyles. 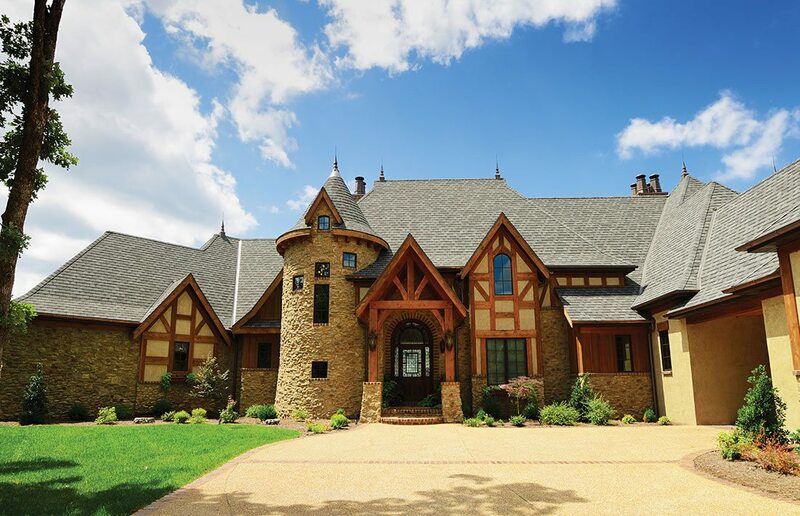 Ramsey Building Company, established in 1995, engineers one-of-a-kind, made-to-order homes in many of southwest Missouri’s most prominent communities. “I enjoy the challenge of coming up with new ideas, finding the products and craftsmen to bring those ideas to life, and then putting it all together for a seamless finished package,” Ramsey says. 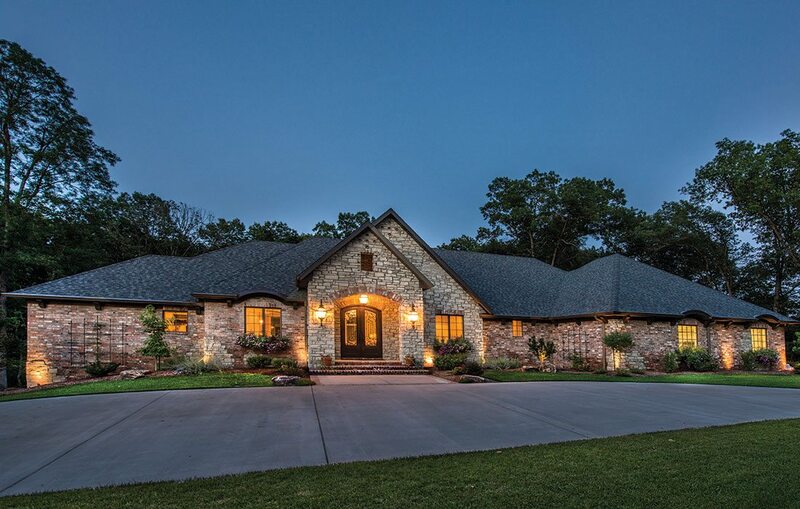 Last June, Ramsey handed over the keys to a stunning six-bedroom, five-bathroom house situated on a ridge overlooking miles of Ozarks prairie. In addition to clean lines and a neutral color palette throughout, walls of windows welcome natural light and call attention to the owners’ simple and classic aesthetic. Photo by James MaidhofTrue slate, reclaimed bricks and aged copper were used to create a stately and striking appearance. Cast stone around the front door and windows lighten the design, grounded with a simple border of boxwoods. Around back, the family can lounge on faux wicker patio furniture, swim to the edge of an infinity pool, or gather for dinner at an outdoor table. 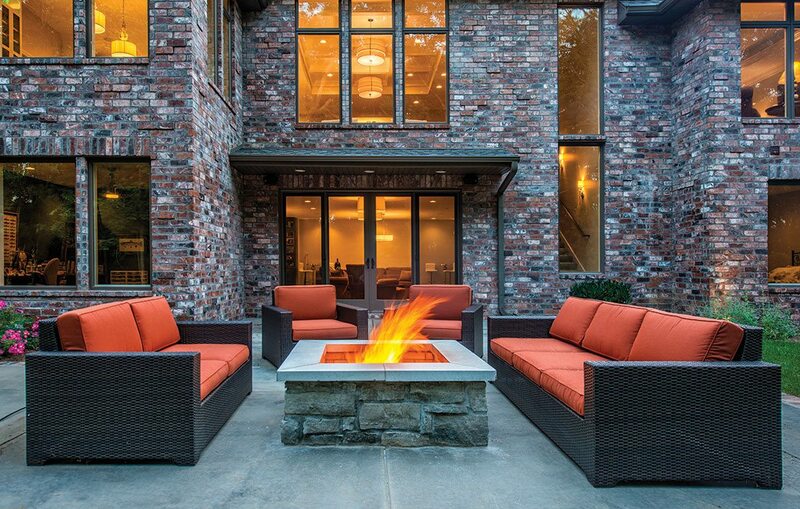 A hot tub and fire pit make entertaining on chilly nights possible and enjoyable. Photo by James MaidhofLeather stools with studded backs and earth tones throughout the bar generate a sense of masculinity in this space, but a flat-screen television and game tables keep things playful. The brightness of recessed and LED pendant lighting, reflected in the glossy onyx bar top, balances rich-colored shelving used to store glassware, bottle openers, and other odds and ends. Beer on tap and a full under-the-counter fridge eliminate trips to the kitchen when the big game is in overtime. Photo by James MaidhofFrom the moment guests walk through the front door, a 25-foot ceiling and three-story windows command admiration. Overwhelming natural light and a calm color palette keep the spot bright, while a vintage-looking chandelier and wall sconces provide supplemental lighting on dark days. For a splash of color, two plush blue wingback chairs pick up turquoise tones in the pool, which can be seen outside. Comfortable sofas accented with blue throw pillows provide ample seating and help tie the space together. Photo by James MaidhofInspiration for this space came from the homeowners’ love of the deep brown tones of African Wenge wood. A less commonly chosen but durable option for flooring, this variety was also used as a band around the sunken tub, which overlooks backyard acreage. 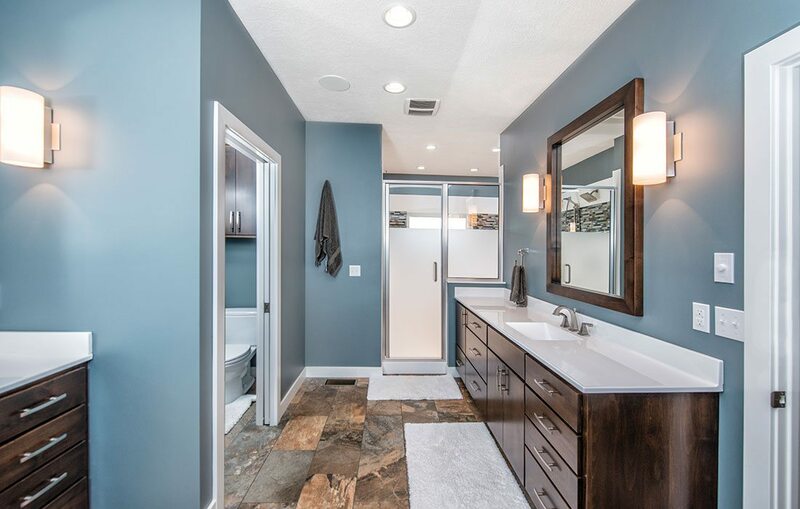 The wood’s stark contrast to light gray walls combined with the sleek design of a floor-to-ceiling shower, dual vanities and a makeup nook gives the room a contemporary vibe. Photo by James MaidhofA barrel-shaped ceiling sets this room apart from every other room in the house. Its rounded corners and those of the door frame leading to a master sitting area are repeated in the curvature of a sleigh bed and leather-wrapped side table. A wall of windows banishes the gloom that might otherwise be associated with gray and brings the outside in, even though the outside is just a few steps away on a private deck. 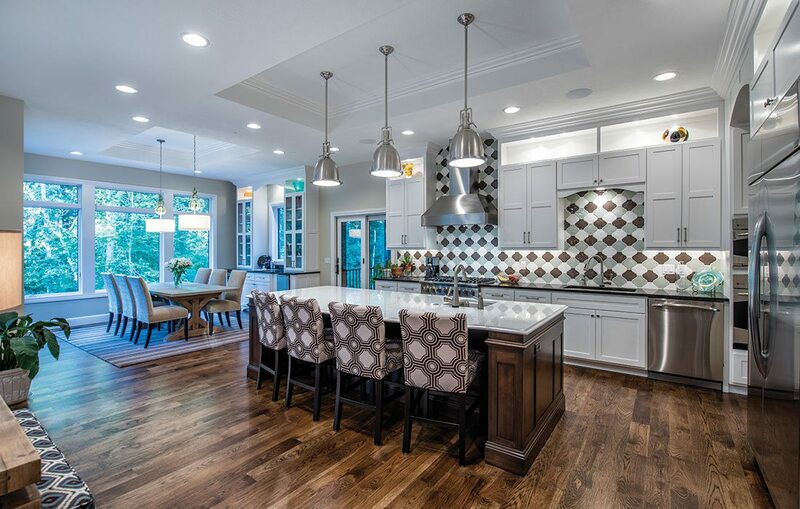 Photo by James MaidhofBuilt for entertaining a large extended family, the kitchen was designed with two sinks, ovens, refrigerators, and dishwashers and counter space all around. Multi-paned, Gothic-style windows that come to a slight point at the top maintain the home’s English-manor architecture, while large floor tiles and a modern ceiling, both details repeated from the hearth room, keep the home’s design consistent. Photo by James MaidhofBelonging to one of the homeowners’ six children, this girly bedroom is slightly elevated above the rest of the second level and has its own small stairway entry. Dark trim and framing around the windows compliment Brazilian cherry hardwood and draw the eye across the outside vista and pool below. The pendant light above the bed splashes a geometric pattern across the purple walls and casts a magical glow throughout the room, especially at night. With a beautiful free-flowing floor plan and several outdoor living areas, this dream home is the ultimate spot for entertaining. Photo by Randy ColwellSitting adjacent to the kitchen, the living room has a custom stone fireplace that stretches from the ceiling all the way to the lower level. The room features a custom coffered ceiling and many large windows, which offer great views of the home’s wooded surroundings. To capitalize on the home’s open feel, the structure of the house was intentionally designed with steel beams, engineered I-joists and roof trusses, which not only minimized material costs and environmental impact but also allowed for the desired open floor plan to exist without the need for exposed beams or columns. And the interior’s open spaces are further emphasized by large window openings throughout the house, most of which provide views to the tranquil wooded surroundings. Photo by Randy ColwellThe kitchen features quartz countertops, a custom-fabricated stainless-steel hood vent, LED accent lighting and a non-traditional patterned backsplash made of ceramic tile. White oak flooring flows throughout the kitchen and much of the main level, and a furniture-style island acts as the perfect anchor to the well-designed room. 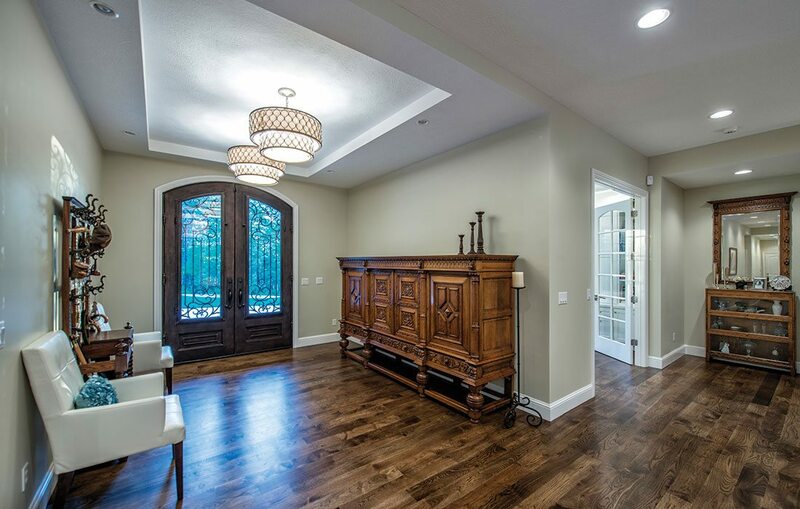 The space is extended with coffered ceilings, which are found in many rooms throughout the home. 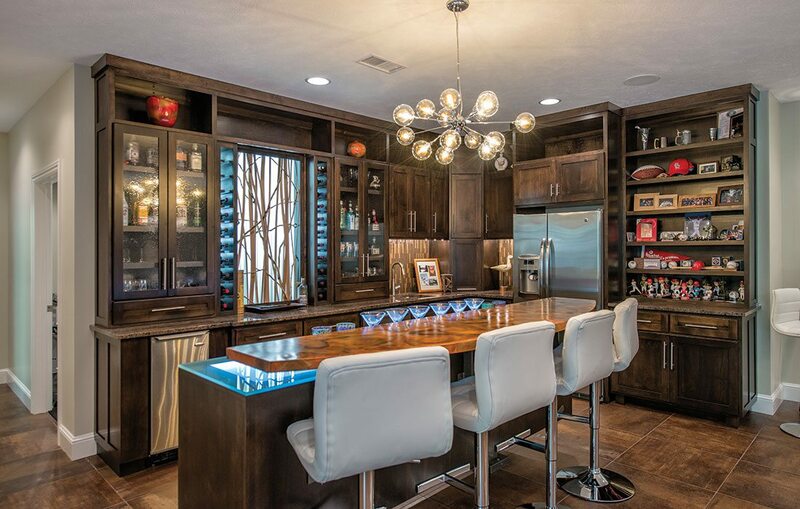 Photo by Randy ColwellTwo hand-crafted light fixtures with specialty blown glass hang above the dining room table, and gorgeous built-in millwork completes the room’s wet bar area. 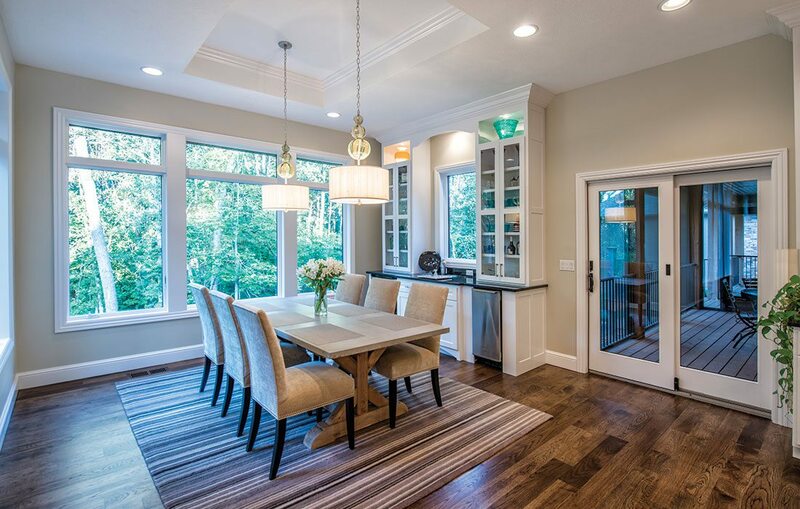 Large windows offer great views of the outdoors, and a pair of double doors opens to a large screened-in porch. Photo by Randy ColwellThe home’s guest bath was dressed with tile, open cabinetry and non-traditional sink basins to give it an edge. “We put a spin on the everyday materials in here to provide a bit of richness,” Rhoads says. Photo by Randy ColwellThe bar in the basement features a floating island that’s elevated from the floor on two steel posts. Rather than choosing granite, quartz or another common material for the countertop, they chose copper, which was then heated to create a one-of-a-kind design. Photo by Randy ColwellA pair of 9-foot entry doors provides for a grand entrance to the home, which was carefully designed to include a wall long enough to house one of the homeowner’s favorite antique pieces. The space flows into the living room area, and an office sits just to the left. Photo by Randy ColwellA fire pit sits on the concrete patio outside of the basement area. 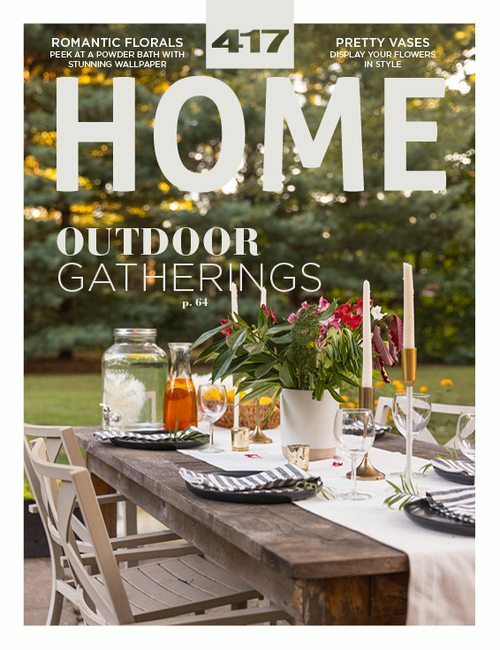 Perfect for cozying up with family or hosting guests, the space is the perfect addition to the outdoor entertaining area. With an appropriate blend of tasteful woodwork and contemporary accents, this custom-built home boasts an eclectic style of its own. Photo by Randy ColwellThe main floor features 9-foot ceilings, as well as large vaulted ceilings to the second floor. Oversized base boards and other trim detailing were used to help bring the space to scale. An exposed post-and-beam structural system allows the main living area to extend vertically up to the second floor. The four bedroom, four-and-a-half bath house features low-pitched roofs and an inset second floor, which helps with energy efficiency. 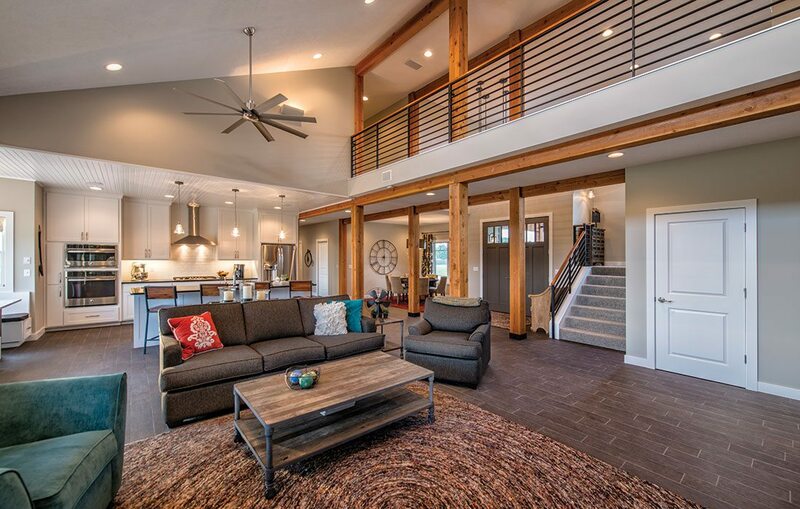 The floor plan is open and free-flowing, featuring an exposed Douglas fir post-and-beam structural system that allows it to extend vertically from the main living area to the second floor. “The kitchen sits in between two large openings, and together it’s open, light and airy,” Rhoads says. And the flow is further enhanced through the clerestory windows and an integrated catwalk that connects each end of the second floor to the staircase. Photo by Randy ColwellThis custom-built home is located on a 10-acre country lot west of Springfield. 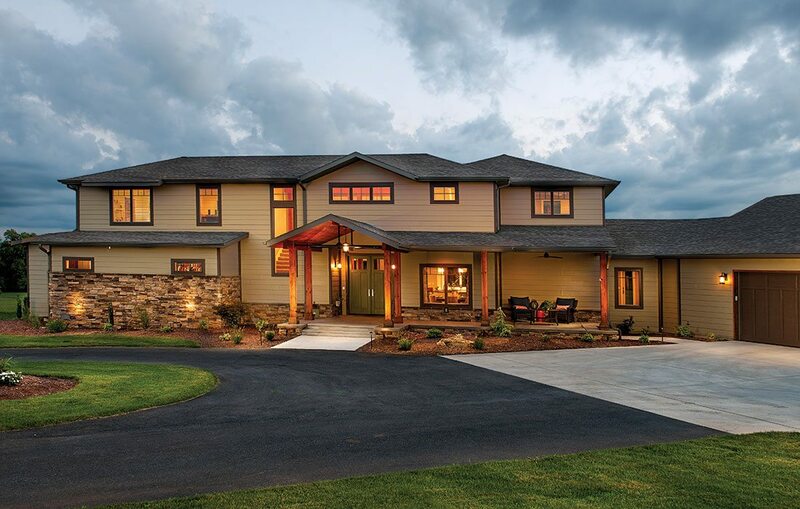 The exterior features cement board siding and is finished with cultured stone. 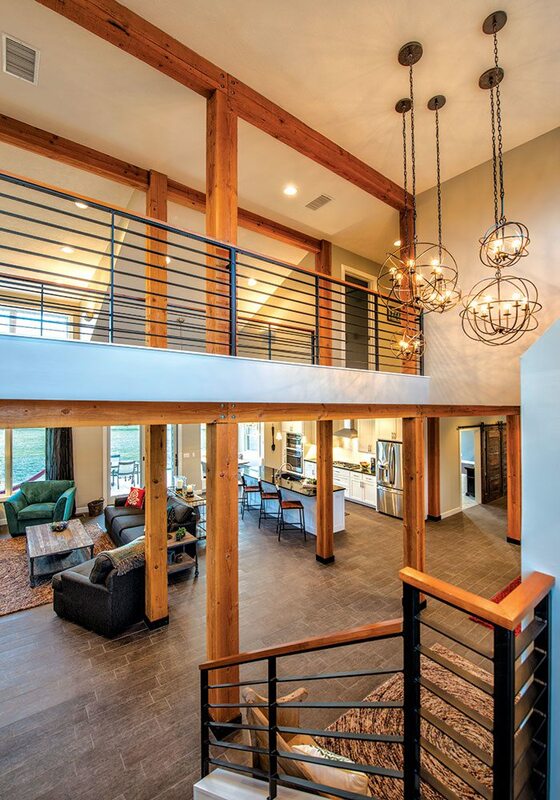 While timber beams typically add a rustic touch, they were combined with other materials on this home to help create a contemporary feel. Photo by Randy ColwellA recreation room sits near the mudroom and just off the kitchen, acting as an extension of the main living area. 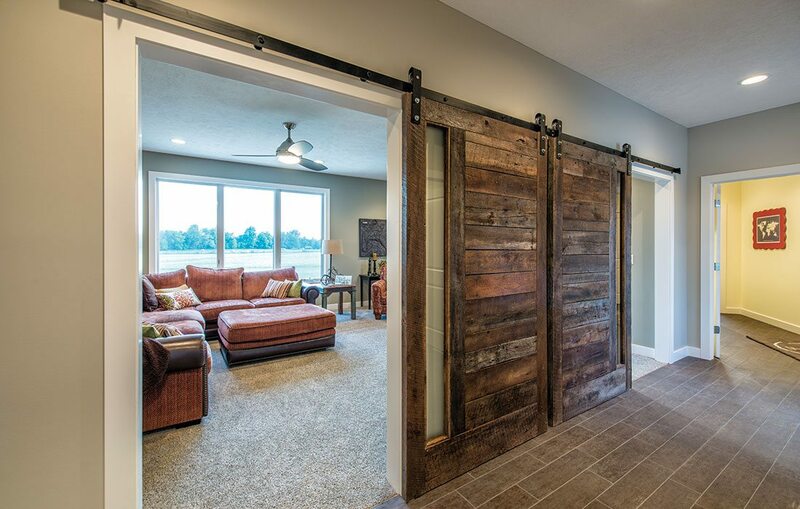 With one quick slide, a pair of barn doors fabricated from reclaimed wood can turn the room into a private retreat for the homeowners’ children. Photo by Randy ColwellAs a gift to the homeowners, Rhoads and his team lined a wall in the powder bath with the same reclaimed wood that was used to created the sliding barn doors. 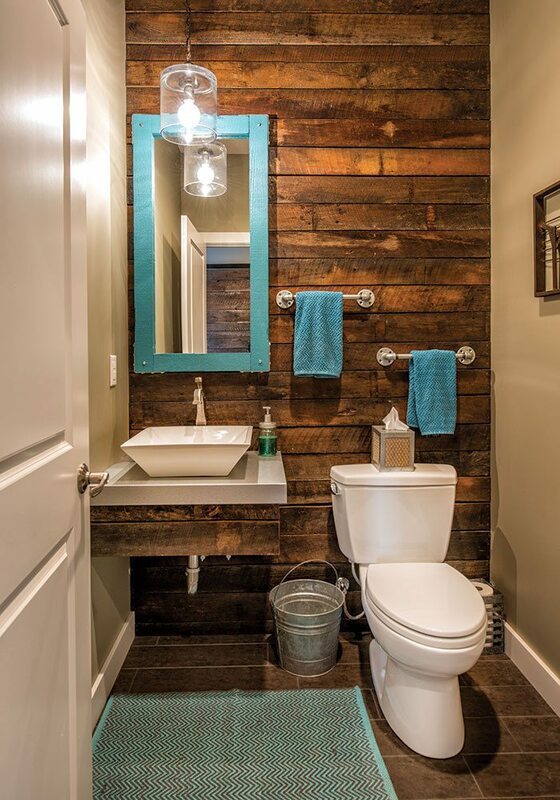 The vanity is also lined in this reclaimed wood, which adds a rustic touch to the otherwise contemporary home. Photo by Randy ColwellThe living room features 6-foot windows, and an 8-foot door sits in the nearby kitchen. While most of the furniture in the home is cozy and comfortable, select items, like the coffee table, give the space a slight industrial edge. Photo by Randy ColwellPainted wood car siding lines the kitchen ceiling, and a granite-topped wood island and custom white cabinetry add a contemporary feeling to the space. Photo by Randy ColwellA wood-grain tile runs throughout much of the main level and offers easy maintenance for the home’s most heavily trafficked areas. A contemporary horizontal steel railing allows transparency through the home’s catwalk and follows a path down the stairs, which are carpeted to help with noise and provide a transition to the more private second floor. Helping complete the look, a wood cap and beam work add warmth to the otherwise contemporary space. “I like these beams because they are truly structural, and the natural splitting and checking of the wood adds additional character,” Rhoads says. Photo by Randy ColwellThe bathroom features a his and hers vanity and a wet room, which features a shower with multiple showerheads and a jetted tub. 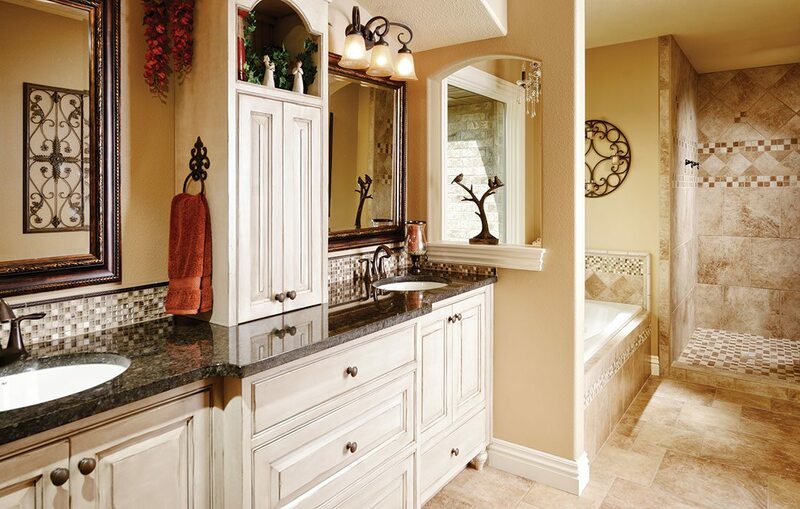 The alder cabinetry is topped with a beautiful cultured marble, and the shower is accented with a high-end tile. With a classic Old World Style and many rustic touches, this 3,130-square-foot home is perfect for the Williams family. Photo by Jeremy Mason McGrawThe custom kitchen features a granite-topped arched island, a custom range hood and beautiful glazed cabinetry. The beams lining the ceiling and the finish on the island add some rich tones to the space, and the adjacent hearth area provides a cozy spot for conversation. The entire area is tastefully dressed with warm, inviting décor, which was carefully chosen to bring the space to life. “Diane worked with my wife, Julie, to tie the décor together in the home,” MacLachlan says. Photo by Jeremy Mason McGrawDoug was very hands on when it came to the home’s exterior,” MacLachlan says. Doug chose the rich colors used on the exterior, and he also weighed in on the home’s shutter size, stone and brick. The house is topped with architectural-cut shingles by Tamko, and a fully irrigated and sodded lawn with custom landscaping give it truly gorgeous curb appeal. Photo by Jeremy Mason McGrawThe guest bedroom features a window seat and built-in custom cabinetry by Cabinet Concepts by Design. “Diane wanted a place where her grandkids could sit and read a book, and she also wanted storage for all of their toys, which is why we built that window seat,” MacLachlan says. Photo by Jeremy Mason McGrawThe large window in the dining room offers a view to the front of the home. The house features ceilings that stretch to 9 feet tall in many areas, with other areas being even taller. But it’s brought to scale with several architectural elements, including custom archways. “We included several archways with bull-nosed edging,” MacLachlan says. 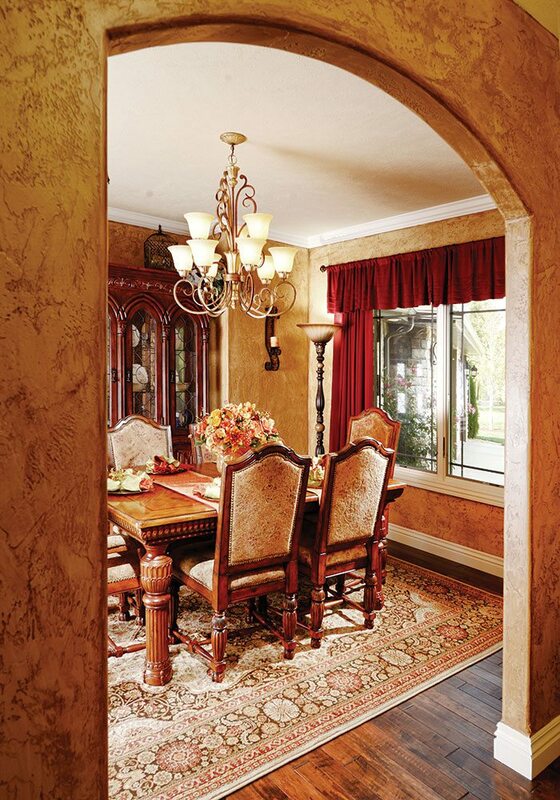 The hand-textured, glazed walls add richness to the space, and the oversized base trim adds a sense of elegance. Photo by Jeremy Mason McGrawThe master bathroom features a doorless walk-in shower, and a pass-through between the vanity area and the tub allows light to freely flow through the space. 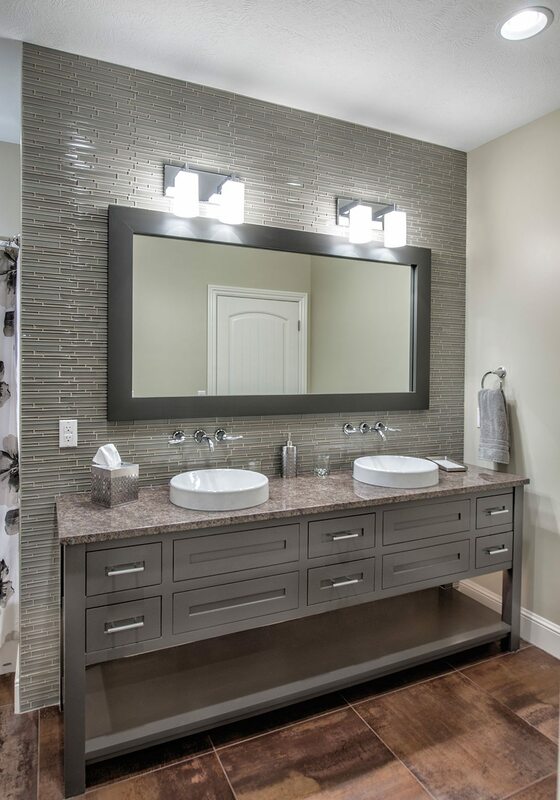 Granite countertops and a beautiful tile backsplash bring life to the his-and-her vanity, and custom cabinetry with an aged finish provides an abundance of storage in the space. The connected bedroom opens to a large laundry room, which is a very useful feature for the homeowners. Photo by Jeremy Mason McGrawThe living room features a floor-to-ceiling stone and brick fireplace and hand-scraped hickory floors, which stretch throughout much of the home’s main level. Angie Mullings, broker/owner of Century 21 Integrity Group, dishes on some of 417-land’s most booming neighborhoods. While many of the areas were originally developed in the mid-2000s, they are now seeing increased construction activity. Located directly west of Springfield, the city of Battlefield is booming with construction and is particularly popular for first-time home buyers. Clover Hill Estates features a variety of all-brick homes, with ranch homes from $180,000 to finished walk-out basement homes from $240,000. The homes are located in the Republic School District. 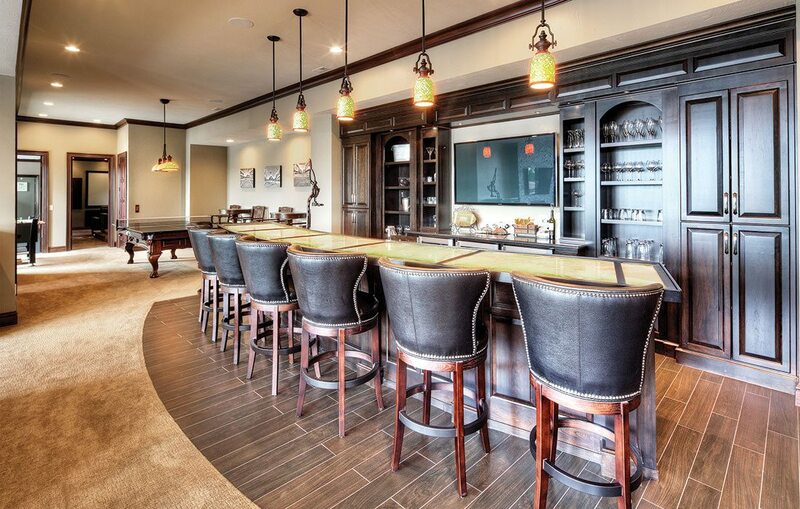 Located south of Nixa, Kelby Creek boasts a picturesque setting and upscale comfort. The neighborhood features larger lots, and homes currently under construction start at $240,000. The community currently boasts a clubhouse that overlooks lakes and waterfalls, illuminated fountains, landscaped grounds and a swimming pool. Conveniently located just east of the intersection of Highway 65 and Battlefield, this neighborhood features many basement homes and lots that will accommodate basement homes. It sits near the new 36-acre Jack Henry campus and is just down the road from Dan Kinney Park. Prices range from $350,000 to $450,000. Pairing privacy with convenience, The Estates at Summit Ridge features 24 lots that range in size from 3 to 11 acres. Homes feature gated entrances, paved private drives, lush landscaping and underground utilities. Lots start in the $190,000 price range. Homes in this neighborhood currently start in the $175,000 price range. It is located near Rutledge-Wilson farm, plus shopping and walking trails. 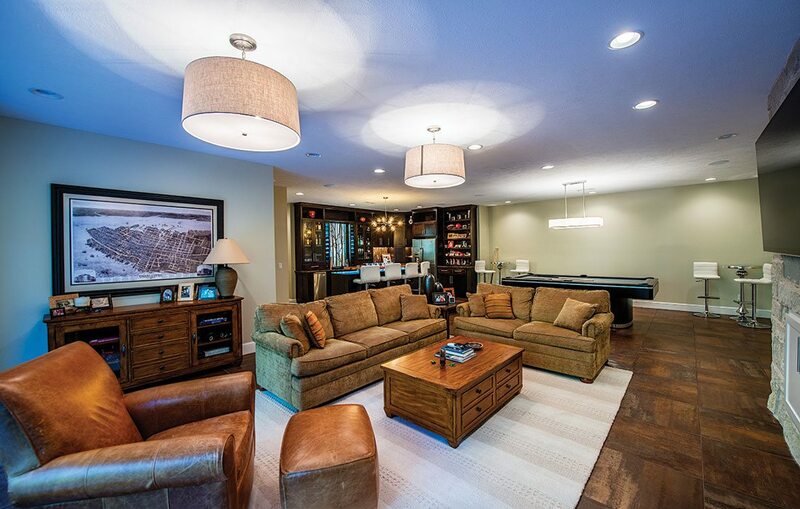 Amenities include a clubhouse, a zero-entry waterfall pool and a basketball court. These homes have Springfield addresses, but they are located in the Willard School District. New construction homes in this neighborhood start in the low $180,000s. Located just off Highway 14 and U.S. 65, the neighborhood boasts an ideal location and isn’t far from downtown Ozark. Residents enjoy a variety of amenities, including a pool and a playground. 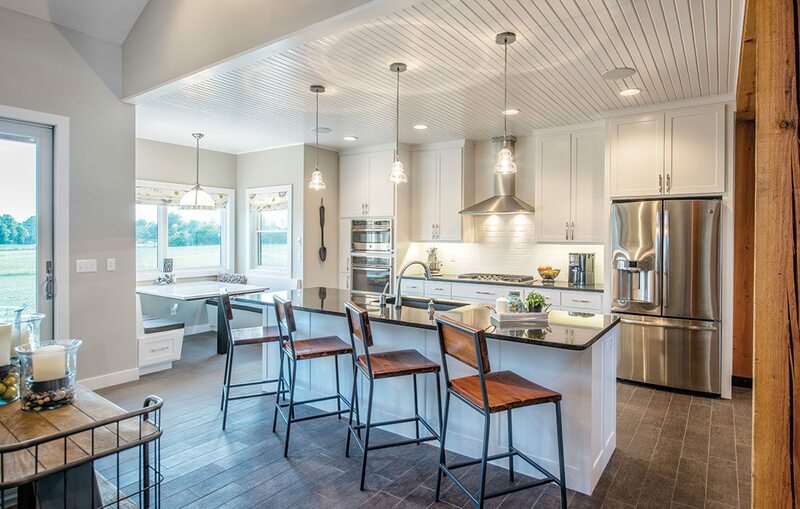 The winning custom home builders and designers share a few on-trend ideas and tips to consider in your custom home build.